Solutions for landscape architects rely on the materials they choose. This represents the level of work shown with their finished masterpiece. It also shows representation over time of the quality of the architecture finalized. If you are working on a landscape, a priority is to have durability and quality with the materials you choose. You can take an extra step by using green landscape materials for your hardscape project. Green landscape materials are becoming more important to municipalities and residents as climates change. According to various studies, it is the hardscape of urban areas that are leading to disintegration of the environment and health. To alter this, many are looking at reworking their landscapes with new materials. These are designed to be compatible with both the environment and citizens, creating a balance between the future and the past. The green landscape materials used for hardscapes are designed to combat against climatic problems in urban areas. Porous materials for hardscapes, erosion control and materials that reduce urban heat island effect are common among those looking for new solutions. 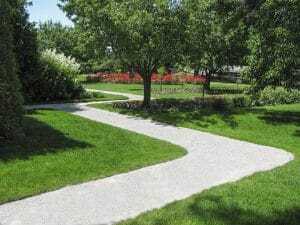 Natural and green materials are able to provide more possibilities among hardscape areas to change how landscape architects are building and renewing their pathways, vehicle areas and other spaces. Not only do the green landscape materials assist in combating environmental problems. The mixtures of high quality materials are able to provide solutions to minimize maintenance. Self – healing formulas are available to deter weathering and deterioration that is common among traditional hardscapes. Quality and durability among the materials takes place through the porous materials and natural reactions that provide support to the mixture of the hardscape. The choices which are made among landscape architects changes the outcome of a project. For durability and long lasting solutions, green landscape materials can be considered. This reduces the impact on the environment while providing durable solutions to those in urban areas. With the proper materials, one is able to create a distinguishable solution for the development of urban areas.